There is nothing like the warmth and sound of a fire roaring in a fireplace on a cold evening. A fireplace should be the centerpiece of any room that has one. The best way to make your fireplace really stand out is with a fireplace mantel. Fireplace mantels come in many types including French country, British colonial, and art deco. One of the most popular types, though, is traditional fireplace mantels. 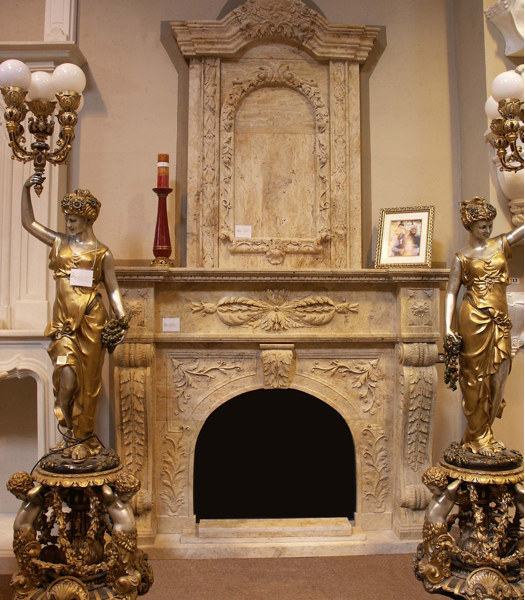 A traditional fireplace mantel typically comes in smooth elegant marble or beautifully carved cast stone. The classic look of traditional fireplace mantels has been around for centuries. The smooth veins in the marble along with its rich color will make every marble mantel look unique. Traditional marble mantels come in many different colors including white, maroon, yellow, peach, gray, and many more. The carved designs of traditional mantels can range from floral patterns to flowing curved lines, to wreath patterns. The endless variety of traditional fireplace mantels is one thing that makes them so popular. Traditional fireplace mantels can also come in cast stone. While these mantels do not offer the uniqueness that a marble mantel brings with it, they are great from custom orders because they are easy to carve with any design that is desired. Whether marble or cast stone, a traditional fireplace mantel will help your fireplace bring even more spark to the room. Fireplace mantels are great for the office too. Impress clients with an elegant fireside room while they wait. Visit our showroom today to see the hundreds of different fireplace mantels we have in stock or sit down with one of our designers to see if a custom fireplace mantel is right for you.